Think of it as a work in progress. This is the first time I tried this technique and the result is not perfect, but at least it looks like it’ll work with a few changes. 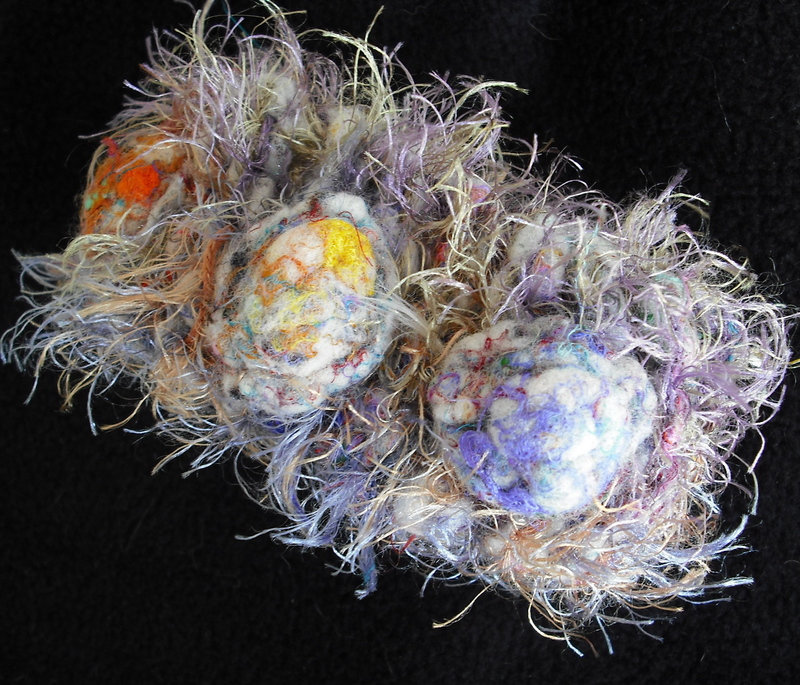 The idea was to make a partially felted bracelet by combining a beautiful hand-spun wool yarn with an eyelash yarn in similar colors. The surface of the bracelet would be decorated with “beads” of plain wool on top. I knit a bracelet-size piece, about 8″ long and 2″ wide, and then stitched little mounds of the wool yarn on top and did the felting thing. The problem is I didn’t make the wool beads big enough, so I added more yarn for the next trip through the washing machine and the new yarn didn’t mesh well with the original beads. The end result isn’t bad — okay, it is pretty awful! — but it’ll be a lot better next time! Fun with Yarn … Again! 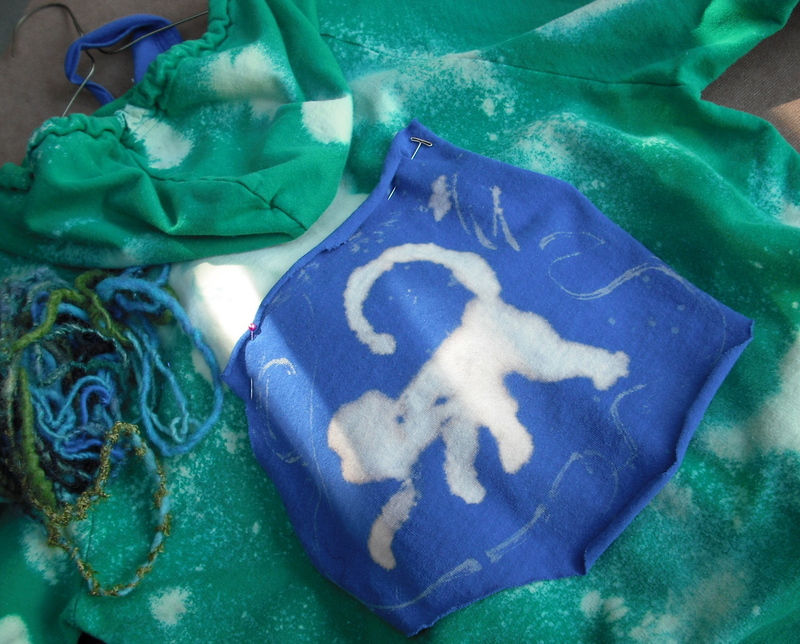 I couldn’t resist adding a bright blue “love monkey” applique to this green hoodie. 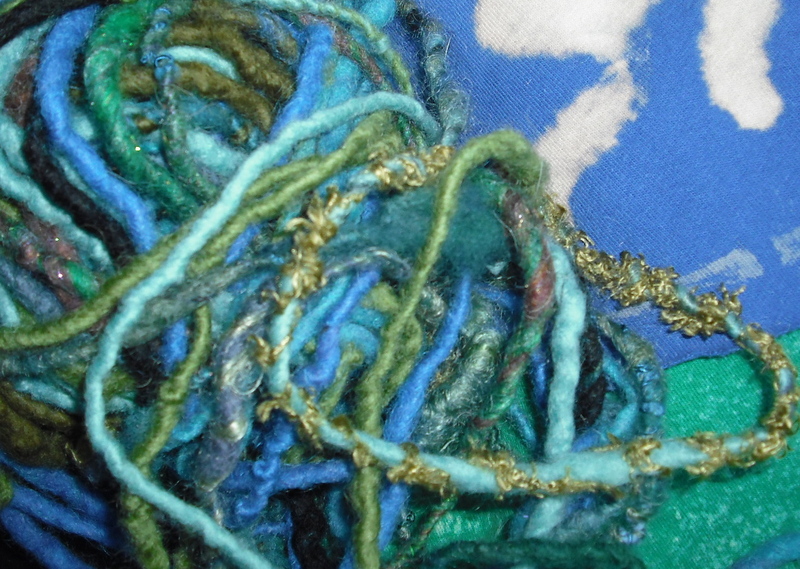 Next, it’s going to get outlined with this gorgeous blue/green yarn. 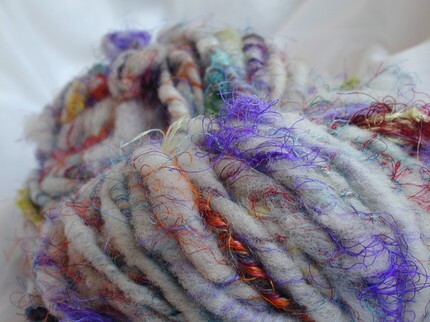 The yarn, from mymixmix, came already felted, so the hoodie can be washed without any problems. Brilliant! This is a little ring I made using a piece of felted cashmere and an orphan vintage earring. 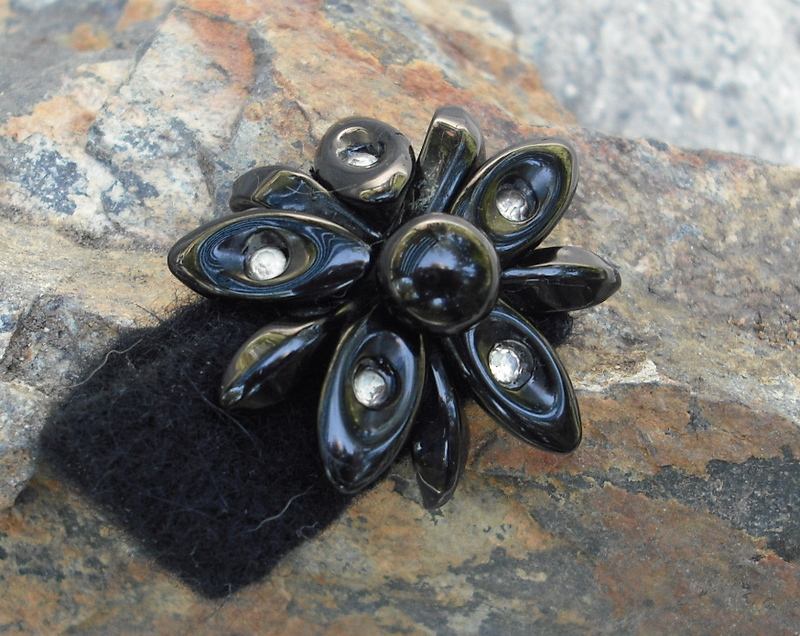 The “petals” of the flower are hinged in the center, so they’re moveable. The ring is soft, stretchy and weirdly cute, so of course I love it. But I’m wondering … a cashmere ring, is that crazy, cool or none of the above? 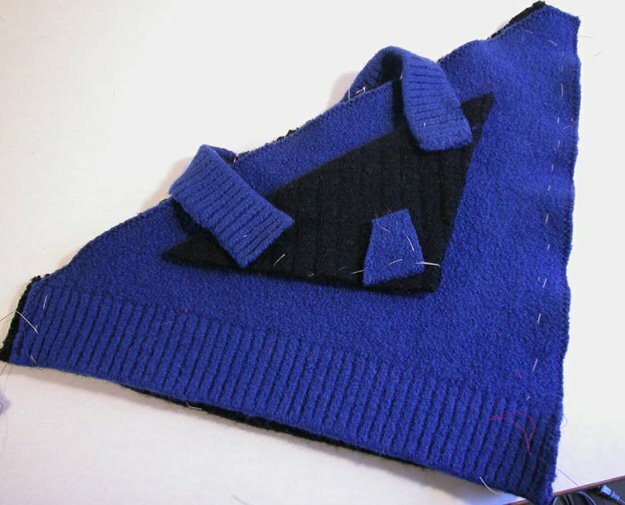 New bag in the works, one of those ideas that just appears out of nowhere — a triangle purse cut from two felted Jones New York sweaters. I love the shape!! All that’s missing is a really great lining, which means a shopping trip to International Silks and Woolens on Beverly Drive. For me, going to ISW is like taking a drug addict on a tour of the evidence lockers at the police station — I’m just dumbfounded by all the amazing fabric. Not to mention an entire separate room with notions!! It’s sort of like getting a preview of what it would be like to die and go to heaven (which in real life is pretty much a long shot). 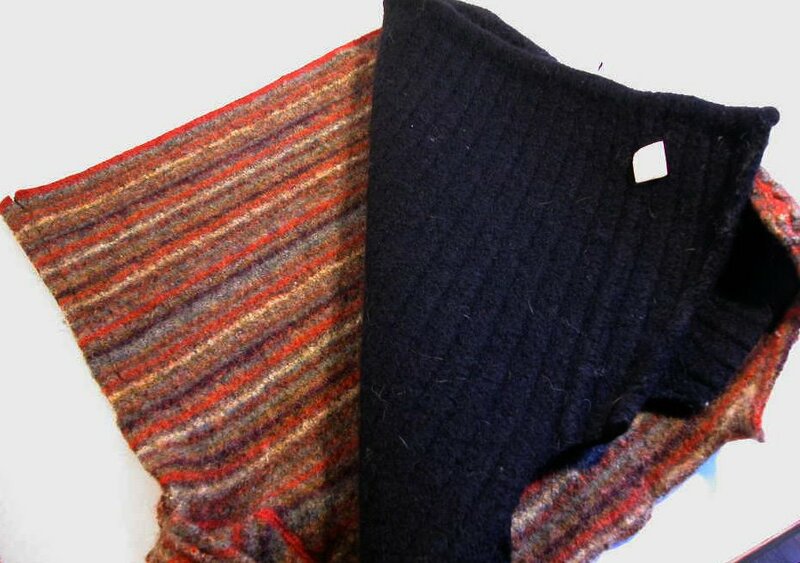 Two felted sweaters, getting ready to become the front and back of a new messenger bag. 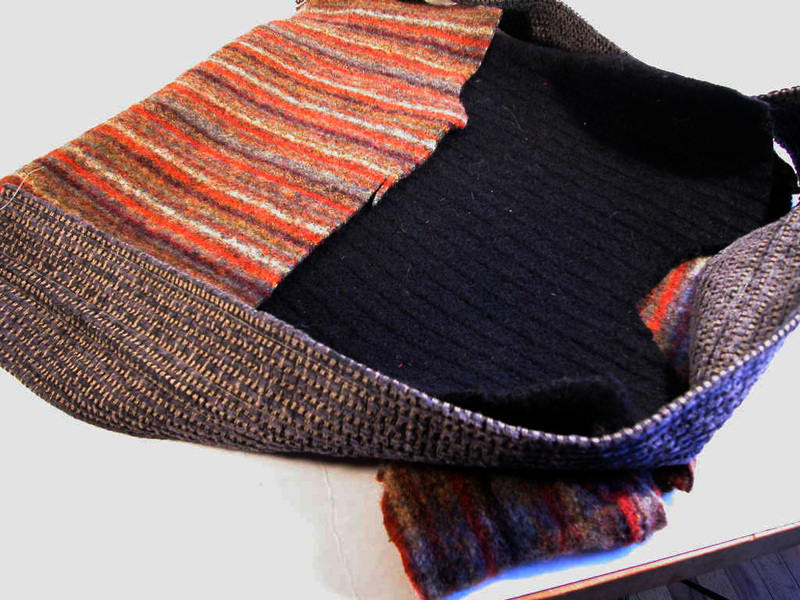 This is trickier than I thought it would be, because the bag will have a gusset (see below) and fitting it all together is a job that requires precision and patience, two things in notoriously short supply around here. Wish me luck!